Virginia is having a major brewery moment, but in the midst of all that something lighter and tarter (and gluten-free) has popped up in Middleburg, VA. 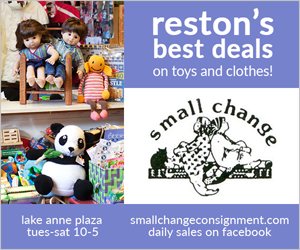 Specializing in small-batch, craft hard ciders and spirits, Mt. Defiance Cidery & Distillery is in full-swing now that it’s apple season. Hard apple ciders can be hit or miss — too sweet to drink or too bland and flat. We were pleasantly surprised by Mt. 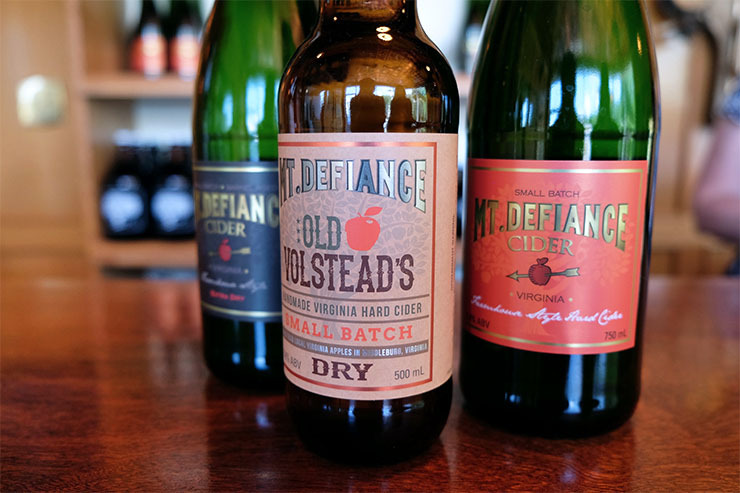 Defiance’s dry, tart and effervescent ciders. It was also really interesting to learn how they manipulate the flavors not only with spices, but with the different yeasts or barrels they use during fermentation and aging. The lead distiller at Mt. Defiance, Peter Ahlf, is a former NASA executive and the attention to detail and process is obvious in their varieties. 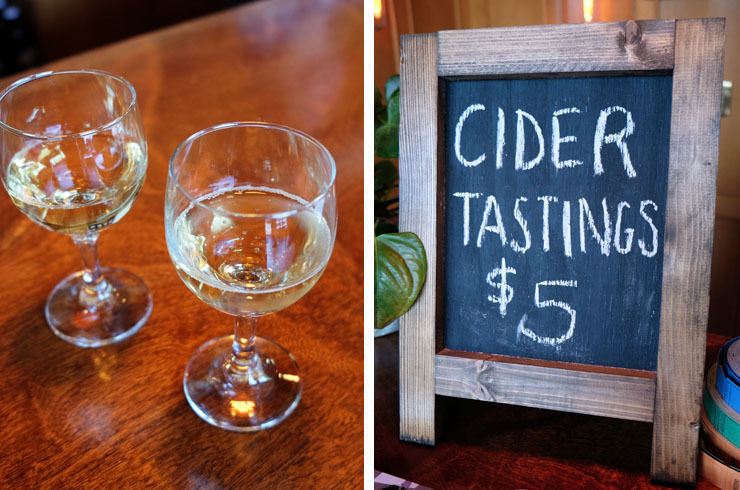 We visited during late summer and tried three ciders that were on tap. The first was their Farmhouse Style cider. It is a classic hard cider, made without added sweeteners or sugar. Tasting room manager Nicole Nicastro told us that this is a great choice with food because of its clean finish. All of Mt. Defiance’s ciders are made from local Virginia apples and the Farmhouse is unpasteurized and unfiltered. The Old Volstead (named after the initiator of prohibition) was the second cider we tried and is made with an English ale yeast and a different custom blend of apples. This one was a little more tart than the Farmhouse and had a great ale aroma. The last cider we tried was their seasonal Summer Shandy. Lemonade is added to the Farmhouse cider for a lightly sweet/sour cider. The Summer Shandy may be gone, but Mt. Defiance has been hard at work crafting new Fall flavors. Their General’s Reserve, a bourbon barrel-aged cider was just released, as well as a Fall spice variety. The General’s Reserve is a strong, darker colored cider with whiskey notes and hints of vanilla and caramel. As the weather gets colder, they are also considering a hot cider. Growlers can be filled to-go. Other flavors, like ginger cider are also available. On the spirits side of the operation, Mt. Defiance produces light, amber and dark rum, absinthe, apple brandy, apple liquor and almond liquor. Their rum and absinthe recently won silver medals at The Washington Cup Competition, which celebrates American-made spirits and liqueurs. Honestly, the absinthe should win a design competition for most beautiful label, too! 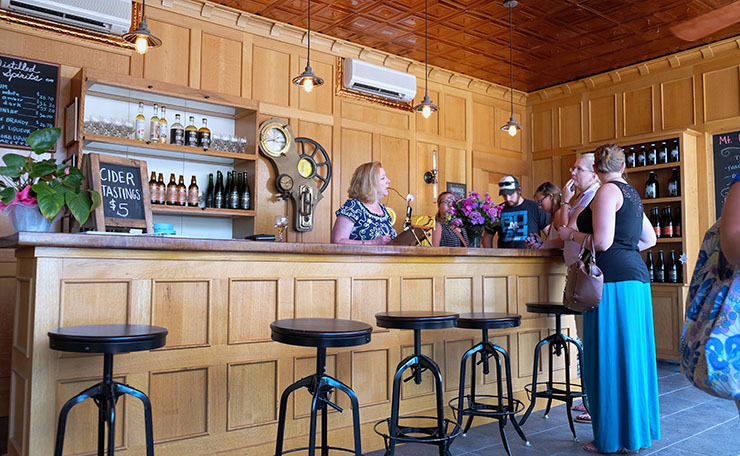 The tasting room is a light-filled storefront of what used to be an old service station on Washington Street in the heart of Middleburg. It’s decor is part Colonial, part Steampunk with a copper ceiling and industrial fixtures. 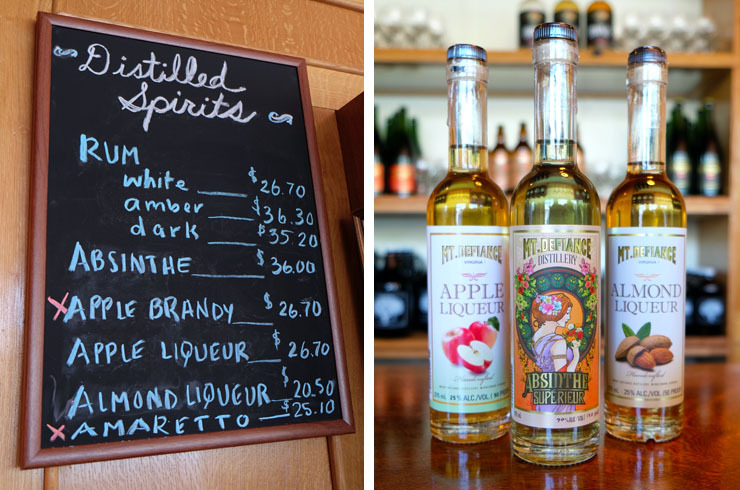 There is a small fee for cider and spirit tastings, but the spirits are more tightly regulated and only available for purchase in their ABC distillery store. Mt. 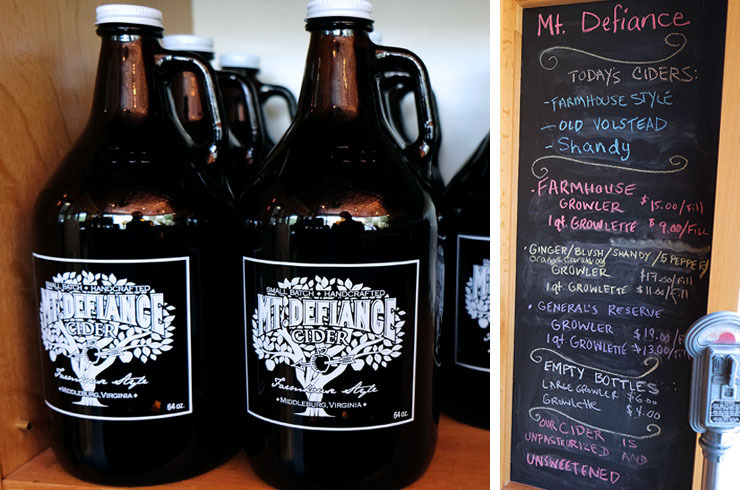 Defiance recently celebrated it’s one year anniversary and has carved out a nice niche among all of the breweries and wineries in Norther Virginia. For something a little different, we highly recommend stopping in for a tasting.